A few days ago IE11 died on my desktop. IE11 came up with only a white screen, nothing else. Nothing I did could get it to work again! Since there is no UNinstall for this piece of crap, I manually deleted everything I could find on the drive. Only 2 files refused to be deleted: ieproxy.dll (used in Windows Explorer) and sqmapi.dll (used in COM Surrogate, whatever that is). Rebooted and only one (temporary) small side-effect was noted: the programs that were pinned to my Start Menu had to be re-pinned, but that was all. After some trial and error I found a super-fast, until then unknown to me browser: Slimjet. To listen to it, just find ANY area-code (like Zip-code) in the UK. IE11 sometimes took up to a minute to finally get going and had the bad habit of conking out at the most inopportune moments, after which a browser restart was needed. This Slimjet browser starts in seconds and has not failed me once in over a week now. It is based on the free Chromium. A COM surrogate emulates an RS232 COM port by devices that still rely on that transmission protocol. I use it extensively for programming amateur radios as they apparently haven't caught up with the 21st century yet. They use USB ports but the radio thinks it's plugged in to a COM port. Did you download the 32 bit or 64 bit version? T520: i7-2760QM(2.40GHz),16GB, 500GB SSD/500GB 7200 Drive, 1600x900, 1GB NVIDIA, DVDRW, Smartcard, media card, FPR, Win7 Pro64, whitelist BIOS, N 6300 AGN, German KB, BT 4.0. 32-bit Slimjet even though my W7-Pro OS is 64-bit. The Pale Moon browser that I use for everything else, is also 32-bit. Faster, less "accident-prone" and less RAM-consuming than their 64-bit versions. Thanks for sharing that classical music link RBS. No, COM surrogate is a host process for COM Objects (COmponent Model objects) that is something like more advanced DLLs. It does not have anything with COM (RS 232 serial port) or Internet Explorer. It is generic system feature. Unfortunately, you replaced the IE11 with even worse [censored] = anything WebKit based. It is slow and very resource hungry. Internet Explorer is by far the most keyboard-friendly browser. It's my preferred browser for that reason alone. Opera is a distant second. I had already tried that, but it did not work. It was saying something like I already had a newer version, so that this could not be installed. What BS! Since I didn't want IE anymore anyway, I couldn't care less. Good riddance to that POS piece of slow bloatware! Thanks for the clarification. That was not correctly explained to me in the past when I asked about it on a communications forum. Not sure where you get your info from, but that's totally wrong! The Slimjet browser has 6 processes but uses only 107.5MB memory and NO WebKit! That is lower than ANY of the other browsers! Got me curious with Slimjet. Will give it a try. Stupid me, switched from Firefox to Chrome. Overall experience is like you're using super-fast and resource-saving version of Chrome. Slimjet is everything Chrome should have been. My Chrome is going to trash bin, finally. In fact, this post was written using Slimjet . Installed it on my T43pSF, quite pleased so far. That POS Google malware is NOT part of Slimjet! It is a leftover from your previous Chrome installation! I was following some of the Chromium branches in the past but somehow totally missed this... Thanks for sharing! Internet Explorer is a garbage browser to be using in 2018 but, I guess it could still be used if really needed. 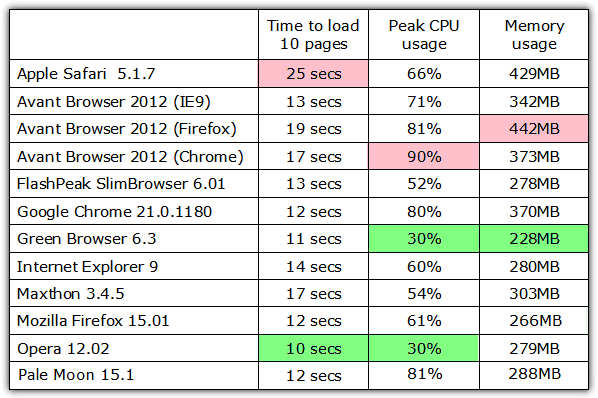 This past week, a website I use extremely often no longer loads in IE. Another site I use a lot also started to not load images properly, in both Opera and IE. I was forced to look for an alternative and didn't think of Edge because I had ruled it out >3 years ago. But then I searched for "best browsers for Windows 10" and one of the articles mentioned that Edge was the fastest. Since Windows 10 already had Edge preinstalled I gave it another try. I first looked through the settings menu and was delighted that Edge is now more keyboard-friendly. Especially important to me is a keyboard shortcut to the bookmarks, which Edge didn't have before. There are also some new settings that I like. Both the abovementioned websites work fine. So I think I am switching to Edge, after using mainly IE for almost two decades (before IE it was Netscape). I'll uninstall Opera, but leave IE alone since it's good to have a backup browser. UPDATE: I just tried Slimjet 10 on an 11-year-old Dell OptiPlex 330 desktop with a Pentium E2180 CPU, just 1GB of PC2-5300 RAM, and running Vista Business 32bit. I was impressed that this browser works so well on such an old, basic system. Thanks RealBlackStuff for discovering it! Here's another great 24/7 classical music station. KUSC. The link is www.kusc.org. There's also an app you can put on your phone. Thank you. Will check it out. Any thoughts on the new P72, finally available to order as of 10/26? Finally the correct description of what Americans call football. Finally! The correct description of what Americans call football .